Cutting-edge, high-performance racing transmission oil specifically formulated for all Honda CR and FourTrax® 250R models. 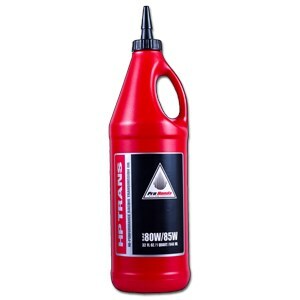 HP Trans Oil is also the hot tip for use in all Honda CRF four-stroke transmissions. Transmission gears can whip conventional oil into a froth, and intense pressure at their teeth can lead to metal-to-metal contact. HP Trans Oil offers ultrahigh film strength and shear stability to minimize transmis- sion wear, while its high thermal stability prevents foaming and premature oil breakdown. Special antifriction additives allow smoother shifting, while minimizing drag and power loss. Antishear additives increase clutch life, reducing clutch slippage.